These dark chocolate flourless brownie muffins are delicious and surprisingly healthy. I make these every once in awhile as a treat for my family and the kids love them! They have NO idea what is in them and I love it! We are gluten free due to some people having allergies in our family, but I also prefer to be low carb in general. I have fond that my body responds better and feels better when I keep my carbs low and my healthy fat high. I try not to eat a lot of beans either, but these are good every once in awhile. 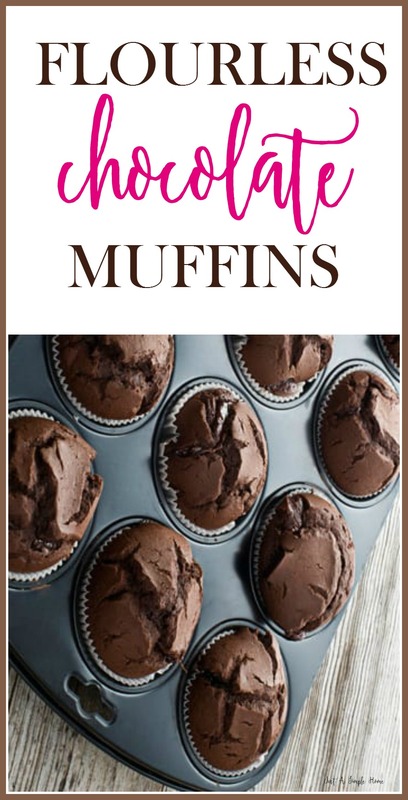 Top each muffin with about four chocolate chips; push into batter. Bake for 18-20 minutes, or until toothpick inserted in center comes out clean. ENJOY! Let me know if you make them! Terryn! This looks so easy. I’m gonna try this out on the kids to see if they notice a difference-I bet they won’t. Also, thank you so much for the nutritional information. You are welcome, Jen! Let me know how it goes! Mine don’t even realize. Hi, Terryn, it looks really yummy. I have a question though, if I want to substitue the chickpeas with almond flour, can you advise me how many cups/grams shoukd I use the almond flour? Thank you in advance for your reply.